From Pluto to the Sun [De Pluton au Soleil]. A virtual Earth-like planet (green) is added to the actual Solar System. 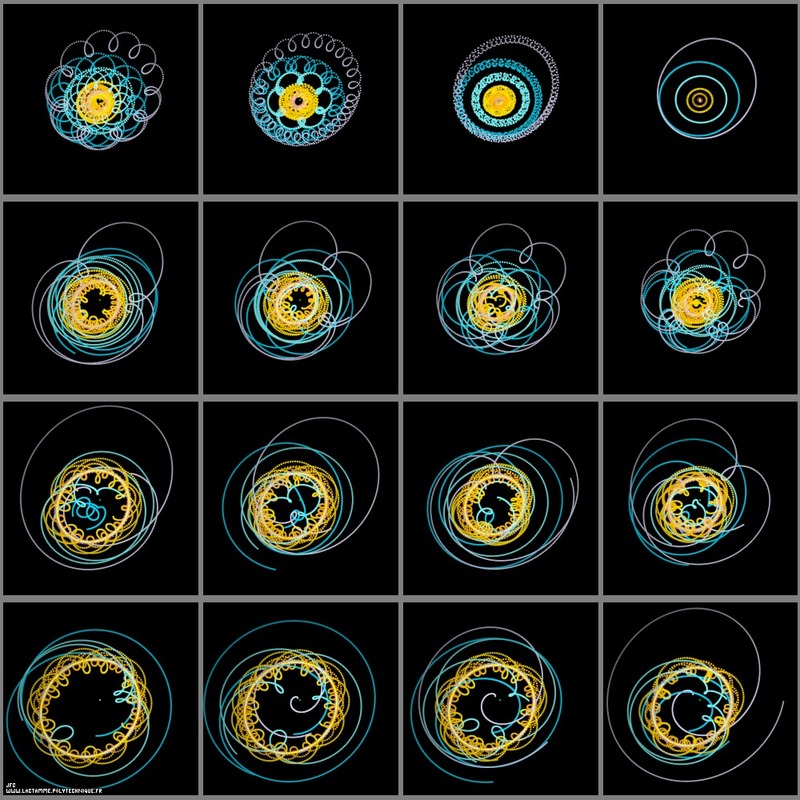 Each frame of this animation displays a particular trajectory of this planet when moved from Pluto -bottom left- to the Sun -top right- (see figure "From Pluto to the Sun"). Each of these trajectories has a duration equals to one plutonian year and belongs to the plane of Pluto. For each of these intermediate trajectories, the 11-body system is visualized with the virtual planet at the origin of coordinates. The relative trajectories look non periodical and even chaotic. Do not forget that the trajectories of the virtual planet and of the Earth do not belong to the same plane -the ecliptic plane-. Is this a new form of chaos: the Virtual Chaos? It is worth noting that the same phenomenon can be observed with with pure uniform circular motions. What kind of science -Mathematics, Physics and Astronomy in particular- and what kind of religions could be developped in a such non regular context?